Inventory is the summation of the value of all raw materials that will be used to make products (raw materials inventory); the value of all the partially assembled product and the labor to assemble it as of the date on the balance sheet (work-in-process inventory or WIP); and the value of all products including the labor to assemble the product that are ready to be sold (finished goods inventory). 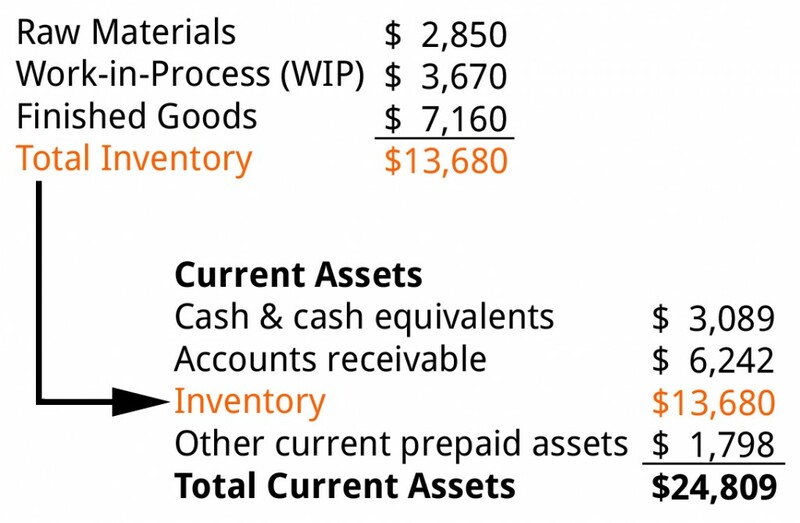 These are all added together under Inventory in the current assets section on the balance sheet. All inventory costs money. It is created at the expense of cash. In fact, this is one way companies can improve their cash position. Decrease your inventory, other things being equal, and you raise your company’s cash level. A company always wants to carry as little inventory as possible, provided that it still has materials ready for its manufacturing processes and products ready when customers come calling.